The 17 Mach 2 is also known as 17 HM2. It's a 22 Long Rifle (22 LR) necked down to 17 caliber. It shoots a 17 caliber, 17 grainbullet at about 2,100 fps. 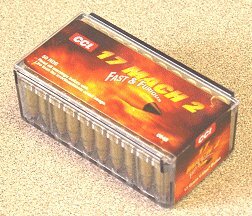 This is CCI brand 17 Mach 2 ammunition, 50 rounds per box. You must be 21 years or older to order ammunition. Ammo must ship UPS ground. Due to DOT regulations, we cannot accept returns on ammo. Please check local and state laws before ordering.